Initially I had decided to set aside September  as fantasy month. I planned to read only fantasy novels, clearing some space on my shelves and start working my way through some of the tomes that I have waiting for me to read. It didn’t turn out that way, however. I did, at least, get in one fantasy novel this month, returning to an old favorite fantasy world of mine, Valdemar in Exile’s Honor. Mercedes Lackey takes readers into the past of Alberich, a Karsite turned Herald, a character who appears in several of her earlier books (although set in the years after this one takes place). I lovingly refer to the Valdemar books as “fantasy fluff” because they are easy and fun to read. I think that part of my continued enjoyment of the series is based on nostalgia, this series of books being the first that peaked my interest into fantasy novels when my husband introduced it to me the year we met. The characters and world are familiar and bring a sense of comfort to me whenever I return to them. 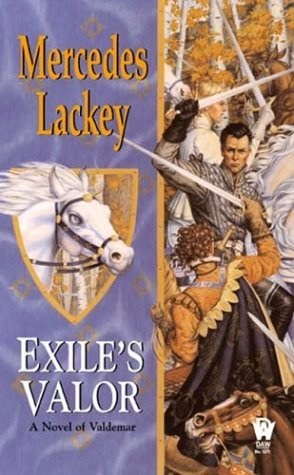 I did enjoy Exile’s Honor, however, the main character seemed to slide through the book with little if any change. Although it can be expected that the heroes and heroines of these novels are good people, they usually go through a somewhat tumultuous self-discovery process. Alberich’s character stayed pretty much the same as those around him grew and moved forward. Even his personal conflict seemed rather static. Still, I had fun and am looking forward to reading the sequel, Exile’s Valor. Exile’s Valor picks off where Exile’s Honor ends. Suddenly Queen Selaney must fight off attempts by the Councilors to rush her into an unwanted marriage. Alberich dons his disguises once again to try and uncover secrets being passed along. He suspects the secrets may involve the Queen or her Court, however, he can’t be sure. Exile’s Valor got off to a very slow start as readers were walked through Queen Selaney’s time of mourning and the attempts to help her through it. It turned into a romance novel of sorts later on in the book. The intrigue surrounding the possible plot against the Queen was what kept me reading. As always, it is a pleasure to visit with old friends and meet new ones in Valdemar, however, I was a disappointed with Exile’s Valor. The story was weak, and I was bored with Ms. Lackey’s descriptive writing style. Nicola - Yes, addicting is a good word. I couldn't get enough of them back then. Loving your 'fantasy fluff' label. Whilst these are books I'd doubtlessly enjoy I have to admit that I find the covers totally unappealing. Tracy - I definitely liked the earlier books more. These aren't my favorite covers, but I remember being a fan of some of the art work on her other books. Mystica - I used to read these types of novels all the time. I need to add some back into my reading rotation. I do love a good epic fantasy novel! Interesting to look back on your thoughts on these books. I haven't heard of Mercedes Lackey. When I look back on some of my older reviews, I cringe...lol. Mine were so bleh. It's nice to see how our posts develop and change as the years pass. Naida - She's quite a prolific author in the fantasy genre. But then, there are so many authors, aren't there? :-) It's impossible to know them all. I can definitely see from reading my old journal entries that journaling was much more a way for me to remember what I was reading rather than to document how a book touched me (which is what I seem to write about more today). 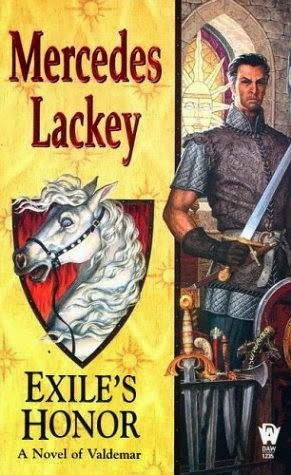 I don't read much fantasy so I've never heard of Lackey but it sounds like these might not be the books to start with! I love the idea of designating an entire month to one genre but I'm not sure how good I would be about it. Katherine - No, I wouldn't start with these. She's written a few much better books. Some of her stand alones are good if you don't want to venture into her series books. I haven't read these,. I've read a lot of fantasy lately because of Carl's challenge; these would probably be a fit for Once Upon a Time. Jenclair - They would fit nicely into the Once Upon a Time Challenge, I think. I have always wanted to try this author but never have. I always enjoy these posts and reading your thoughts on books from years ago.